The Wi-Fi arms race continues. In the wake of Google’s OnHub router launch, Asus has announced what looks to be an astonishingly powerful new device: The RT-AC5300U, This 4x4 consumer router, promises to deliver two 5GHz 802.11ac wireless networks with TCP throughput up to 2165Mbps each, and one 2.4GHz 802.11n Wi-Fi network with up to 1000Mbps of TCP throughput. And where Google’s OnHub router hides its antennas—and blocks users from tweaking most of its settings—the RT-AC5300U bristles with eight upgradeable antennas and is packed with features that have consistently set Asus routers apart from the pack. Google’s OnHub—an AC1900 router that delivers maximum throughput of 600Mbps on the 2.4GHz band and 1300Mbps of throughput on the 5GHz band—delivered exceptionally good performance in our recent review. But we dinged it for not letting buyers use its USB port to share storage or a printer and for taking too many configuration decisions out of users’ hands. 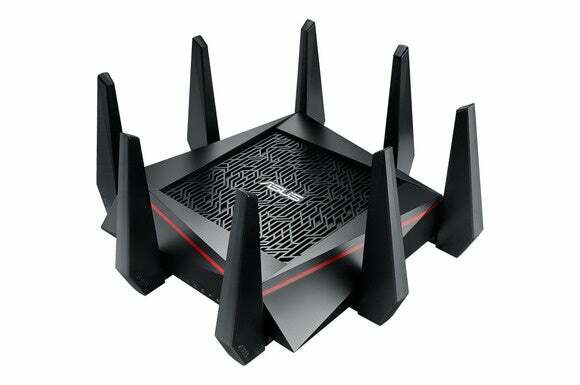 If past is prologue, power users will have a field day tweaking this new Asus router’s settings. Asus has only released a spec sheet for the RT-AC5300U and one photo that makes it look like a headcrab from the alien-invasion game Half-Life. (Its squarish form factor also makes it look a bit like TP-Link’s Archer C3200). Asus says the new router will ship in the fourth quarter, but hasn’t released pricing information—and Asus has issued very optimistic ship dates with some of its of earlier routers. As with past models in the Asus RT series, this one will have a DLNA media server, ftp and SAMBA file servers, one USB 3.0 port and one USB 2.0 port for sharing storage and a printer, and a 4-port gigabit switch. The router will boast 128MB of flash storage and 256MB of DDR3 RAM. That leaves plenty of room for third-party open-source firmware developers. How long will the Asus RT-AC5300U be the only AC5300 router on the market? Why this matters: Despite its long spec sheet, the Asus RT-AC5300U lacks some features that the OnHub does have: Support for Bluetooth and any of the protocols that could become the de facto standard for the connected home. On the other hand, none of those OnHub features are actually active in the OnHub you can buy today. If Google—or any other player—succeeds in creating a new market for networking hardware that’s super easy to set up (and difficult to screw up because you don’t get to make very many meaningful choices), the biggest danger for enthusiasts is that the remaining market for hardware that’s supremely powerful—and perhaps necessarily more difficult to install—will become too small for vendors like Asus, Netgear, D-Link, Linksys, and other top-shelf players to continue investing in. Here’s hoping I’m just being pessimistic.